“Why must every rib be a barbecue rib?” said Michael Austin in the Chicago Tribune. Barbecue purists wag their tongs at baked ribs, but the Spanishstyle recipe below is great on days when you don’t want to fire up the grill. The paprika-based rub has an “earthy depth,” and the quick homemade salsa verde provides a “bright and zesty” complement. • Remove the membrane from the backs of the ribs. Combine 2 garlic cloves and 2 tsp salt in a mortar, and smash with a pestle until a paste forms. Stir in ½ cup olive oil and the paprika. Rub ribs with paste to coat all over; transfer to a large covered container. Refrigerate at least 2_hours or overnight. • Preheat oven to 225. Cover a rimmed baking sheet with a large piece of aluminum foil. Set ribs on top, then wrap them up. Bake 1½ hours. Remove pan from oven. 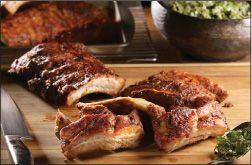 Unwrap ribs; return pan to oven and bake until ribs are very tender but not falling off the bone, about 1½ hours.